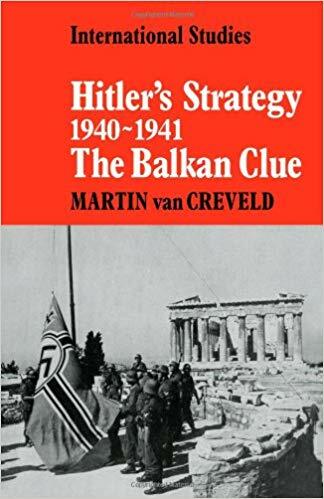 The conventional view is that Hitler regarded the Balkans simply as a distraction from his plans to invade the Soviet Union. In this book, Martin van Creveld suggests a different interpretation. He argues that Hitler was determined on using the Mediterranean as an indirect way of damaging Britain when his invasion plans came to nothing. It was only when he decided to attack the Soviet Union that his focus changed, and even then, the invasion of Yugoslavia and Greece did not cause any delay to Operation Barbarossa. 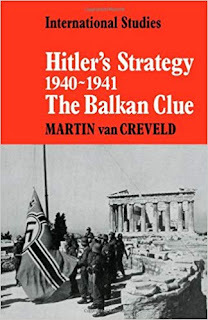 This is a book about the strategic decision making that underpinned Hitler’s approach to the Balkans in 1940-41. The military campaigns are only briefly covered and much better covered in recent books including Greece 1941, which I reviewed earlier this week. It was published in 1973, but there are copies to be found second-hand. Part one deals with Hitler's ‘war in the periphery’ strategy against Britain after France was defeated. 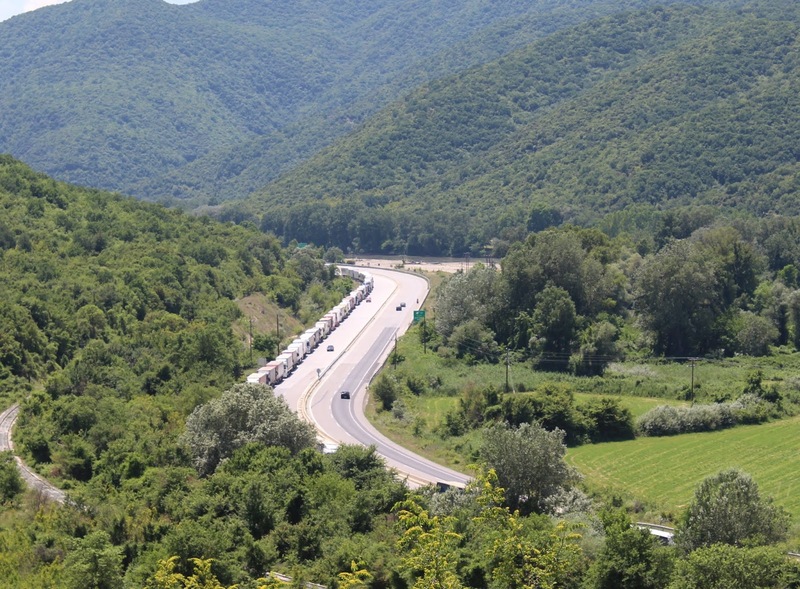 It also emphasises the importance of raw materials in the Balkans (oil, chrome etc.) to Germany’s war effort. This led to a demarcation line between Hitler and Mussolini, in which Italy held the Mediterranean coast in its sphere of interest, while the mainland Balkans ‘belonged’ to Germany. Although the line between the two was not always clear. In this context, the author argues that Hitler gave the green light to Mussolini’s invasion of Greece - or at the very least did not impose a veto. In a meeting at the Brenner Pass on 4 October 1940, it seems likely that Hitler accepted that Greece was a matter for Italy while vetoing any invasion of Yugoslavia. The Italian Foreign Minister, Ciano, said as much to Ribbentrop, who checked with Hitler himself, who did not repudiate this. This also makes sense from a German perspective. It continued the ‘war in the periphery’ and kept British bombers away from the Romanian oilfields. Part two deals with Hitler's problem with the Soviet Union’s territorial expansion in the Balkans and the failure of attempts at reconciliation. Hitler then reached the conclusion that he would have to invade and that required a safe flank in the Balkans. He thought he could deal with Yugoslavia diplomatically and only authorised Operation Marita against Greece when his diplomatic overtures there failed. The Italian failure in Albania added to his problems and the Coup d’état in Belgrade resulted in a further diversion. However, it also solved logistical difficulties in supplying the 12thArmy in Bulgaria and made it easier to manoeuvre the panzer divisions around the Greek positions, by going through southern Yugoslavia. The Rupel Pass during my visit last year. It was the scene of heavy fighting between German and Greek forces in 1941. By June 1941, Germany had withdrawn most of its divisions from Greece, and they were back in position for Barbarossa, or in strategic reserves. The author convincingly explains the redeployment of units and concludes that Germany had plenty of spare divisions for Marita and this diversion did not delay Barbarossa. The occupation of Yugoslavia actually made it easier to use the roads and railways in that country. Germany had no other strategic objectives in the Mediterranean, and as a consequence, the Balkans became something of a backwater. At least until 1943, but that is another story. This is a well-argued book, based on primary sources in Italy and Germany. It offers a convincing alternative view of the traditional narrative of these campaigns.